Nadi Shodhana (nah-deeh show-dah-nuh) is a yoga breathing practice which relaxes the body and mind and is said to balance the sides of the brain and purify the energy channels of the body. It is safe for pregnant women and women trying to conceive. Nadi shodhana is an excellent practice to use during stressful moments in your day or any time you wish to relax and return to your center. Sit in a comfortable position and lengthen your spine, creating extra space throughout your body. Bring your right hand to your face, palm facing inward, and lower your pointer and middle fingers. Place your right thumb over your right nostril, and exhale through the left nostril. 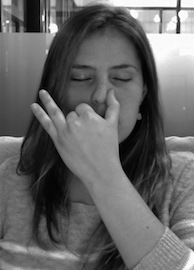 Release your right nostril as you cover your left nostril with your ring finger and inhale through your right nostril. Exhale through your right nostril. Cover your right nostril with your right thumb, release your left nostril and inhale through the left. Repeat, inhaling and exhaling through each side before switching. Continue for several rounds until you’ve got the rhythm down. Finish the practice by exhaling through your left nostril. Modifications: While traditionally this practice is done using the right hand, feel free to use your left if that is more comfortable. You also might try supporting your arm using a prop if you get tired. It is common to notice a difference between your right and left nostrils. One might be really clogged up and the other free. Try to breathe through any inconsistencies, but stop if it becomes too hard to get air. Release: After completing the rounds of breath simply let your hand fall to your lap and return to a normal breath. Notice any changes that may have taken place in your body, breath, or mindset.